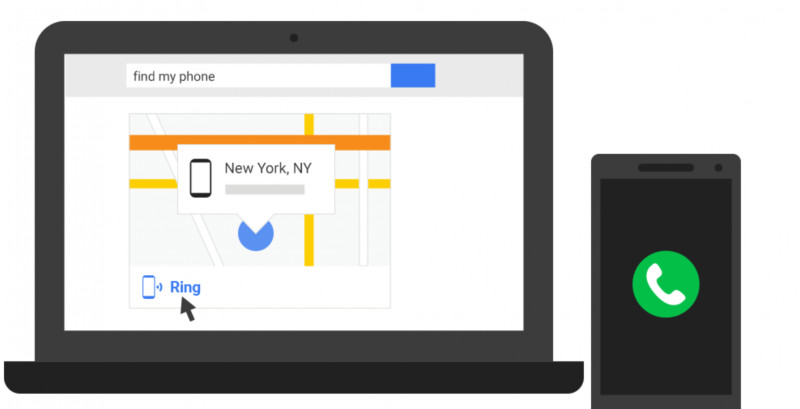 Google already provides its mobile user base with the Android Device Manager in case a device gets lost or stolen. The app allows users to lock out their devices remotely and even erase sensitive data that may be on them in cases of emergency. However, in other cases it may be useful for some to be able to simply locate the device when it has been misplaced nearby, so Google is introducing a new “find my phone” feature. The new feature isn’t found in the ADM app, but rather right inside of Google search. The company has added a search query prefix which gives Android users the ability to see where their devices are right on a Google map or even make them ring. Typing “find my phone” in any typical Google search bar will access the new feature while bringing up the aforementioned map and options. As Google says in its announcement post for the new search feature, it is more geared towards those times when you’ve simply misplaced your device nearby like somewhere in the home/office or “at the bar.” While the find my phone feature does not allow you to lock or erase the device the way ADM does, it is a nice touch to be able to see where your device is at anytime and will surely come in handy for some.